Regular Tarot Bags - Pride Single Draw Tarot Bag - Tarot Bags, Tarot Cards, Cloths, & More! 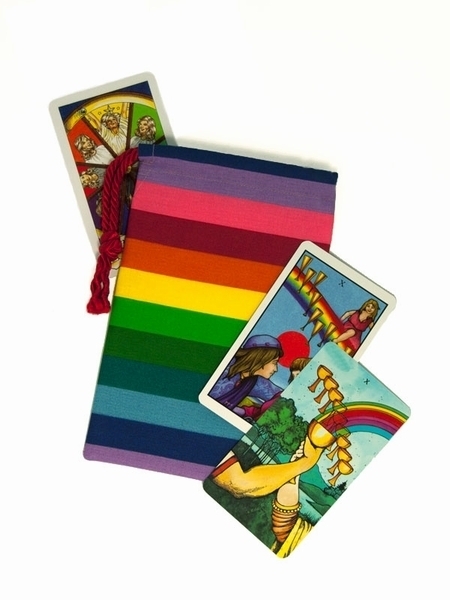 To honor all of those who have fought for equal rights, and in recognition of the ongoing, struggle of LGBTQ people everywhere, we proudly offer our rainbow patterned Pride Tarot Bag! We bought this fabric not long after June 26, 2015. On that day, the US Supreme Court announced its decision in Obergefell v. Hodges case. They ruled that the 14th Amendment of the US Constitution guarantees the fundamental right to marry for all people. While the fight for equal rights for all is far from over, the Obergefell decision represents a milestone. So if you're gay, lesbian, bisexual, transgender, queer, or otherwise inclined � or if you want to show your support for those who are � this is the bag for you! Rainbow Symbolism: Since the 1970's the LGBT community has used the rainbow symbol to represent not just the diversity among them, but the beauty of that diversity as well. Among other things, the rainbow is a symbol of the path to spiritual fulfillment. 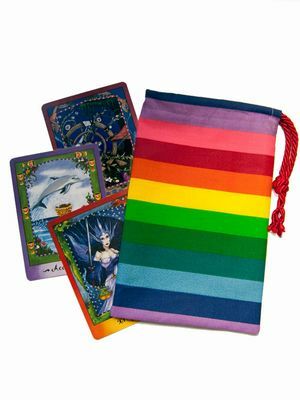 Design: Our single draw bags are a no-fuss, streamlined option for keeping your tarot cards protected. The single drawstring cord easily slips over your wrist for when you're on the go. All seams are quadruple stitched and the drawstring opening is reinforced. See our Quality page for more details about construction. Size: Measures 5" wide by approx. 7-3/4" inches tall (12.7 x 19.7 cm). Fits most standard tarot card decks (3" x 5" and smaller).